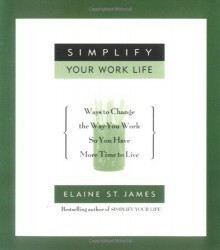 With more than two million copies of the Simplify series books in print -- now there are two million and one reasons to simplify, simplify, simplify.Elaine St. James' Simplify series has taught the world how to start doing less and enjoying it more. Now Elaine teaches us to balance one of life's most difficult areas: the work world. Filled with tremendously helpful advice, and easy yet profoundly smart suggestions, her new book shows us big and small ways to scale down and simplify life on the job, such as:--Breaking the habit of bringing work home from the office--Estimating the time it will take to complete a project, then double the estimate--Cutting back on the amount of time you spend working--Learning how to make the right decisions quicklyWritten in the same upbeat, relaxed, and matter-of-fact tone that won millions of readers to the simplicity movement, Simplify Your Work Life is certain to attract even more followers.Elaine's syndicated weekly column Simplify Your Life is carried in 50 newspapers nationwide and is read by more than 2 million fans each week.